That's cranberry jam on that sandwich! It's not too late to talk turkey. Yes, Thanksgiving is over, but turkeys aren't done being sold. You can buy a lovey turkey breast all on its own, or do what I did - buy a whole turkey and cut it into reasonable pieces. Right now, I have one breast and two thighs in the freezer. One breast has been cooked. The carcass, legs, and wings were roasted. Some parts became stock that then became gravy or soup. Meaty parts had their meat removed and added to the soup. In years past, I smoked turkey breasts, or I cooked them on the barbecue grill. This time, I decided to go the easy route - I cooked it via sous vide. Some turkey went into sandwiches, and some went into other recipes. But mostly, I wanted that breast for sandwiches. It's one of my favorite things to do with turkey, and by cooking it sous vide, I had a super-tender breast that wasn't the least bit dry. I'm finding that cooking pretty much anything sous vide is insanely easy now that I have the Anova Sous Vide with bluetooth and wifi which has an app with a bunch of recipes. I basically just typed in "turkey breast" and picked one of the recipes to get the time and temperature. I didn't continue with crisping the skin since I just wanted the meat for sandwiches. Put the turkey breast in the sous vide bag along with whatever flavorings you like. I had gotten some salts (about a tablespoon each) as a sample, so I used some of the smoked salt. I didn't add any fat, but I considered it momentarily. But any herbs or flavorings you like would be fine, I'm sure. Seal the bag. Set the sous vide for 145 degrees and three hours. Place the bag in the water and cook. When the ime is up, you can brown the skin in a hot pan with a little oil (pat the turkey dry first), if desired I just let it cool and used it for sandwiches. Cranberry sauce is fine as a side dish on Thanksgiving, but cranberry JAM is amazing on toast, English muffins, or stirred into yogurt. Try it on that English muffin with a little smear of cream cheese. Spread it on the bread for a turkey sandwich. Or how about on quesadilla? Yeah, that's good too! Or as a filling for jam thumbprint cookies. Cranberry season is fleeting, but I'll bet you can find them on sale now, fresh, and maybe even a better deal frozen. Speaking of frozen, you might want to toss some in the freezer so you can make this any time. It's so simple and soooo good. You don't even need pectin to make this! I like mine more tart than sweet, but you can certainly add more sugar, if you like. And you can also experiment with flavors. Or add other fruits, like apples, pears, strawberries, blueberries, or raspberries. Have fun with it! Why yes, that IS a lot of cranberries! Put everything in a saucepan. Heat, stirring as needed until the cranberries pop and the mixture boils and becomes thick. It doesn't take a long time, so don't wander away from it. Give it a taste and add more sugar if it's too tart for you. Stir to combine and taste again. Use a stick blender to blend the mix smooth. Or, transfer to a blender. Pass the mixture through a fine-mesh sieve to remove the seeds and any unblended skins. Transfer the mixture to containers for storage, and refrigerate. Note that this is NOT a canning recipe - I have no idea if it would be safe. I'm also not sure how long it lasts, since I somehow manage to use it all before it goes bad. Want more flavor? I like this as-is, but you can certainly add more flavor, like vanilla extract, almond extract, lemon, ginger, cinnamon, chipotle, basil, or pretty much any flavor you think will be compatible. I'm rather fond of German food, including wiener schnitzel, which has nothing to do with hot dogs. Or any sausage, really. It's actually a veal cutlet that's pounded thin and breaded. Chicken is pretty much my go-to substitution for veal, particularly in dishes like this. So I ended up with chicken schnitzel. The spice mix I used came from Raw Spice Bar which is another subscriptions service. There are soooo many subscription services. This one is different because you get packets of different spice mixes, so it's not like you need a lot of space to store jars and bottles and bags. And the bags are sealed, so you don't need to use them all right away. They sent me a couple different boxes. Well, envelopes, actually. You get packets of spices, not jars. One had a cocoa chili rub that I used on steak, a pizza seasoning that I used on chicken and a chipotle salt that I used on popcorn. The ones I got most recently included schnitzel seasoning; caraway, fennel, and anise seasoning; and mustard and horseradish seasoning. So far, I've only used the schnitzel seasoning from the second batch. I haven't decided what I'll do with the others, but the mustard and horseradish might go into a salad dressing or dipping sauce, and the seedy one will probably go into a rye bread. So, I decided to use the Schnitzel spice to make some chicken. This uses my secret breading technique. I used to hate doing any kind of breading. It took three bowls or plates, for the flour, egg, and then the final breading mixture - sometimes bread crumbs, some times more flour. And then it was messy. Okay, my technique is still a little messy, but it only requires one bowl, so that's a huge plus. And the breading stays on better. Try it, you'll like it! Combine the flour and seasoning. This makes it pretty spicy. If you don't want it as spicy, use half as much spice or twice as much flour. If you're using the larger chicken breast (you know the ones I mean, right? ), use a sharp knife to slice it in half to make two thinner pieces, then pound the two pieces until they're evenly thick and no more than 1/4 inch thick. If you're using smaller breasts, don't split them; just pound thin. Coat the chicken pieces on both sides with a thin coat of mayonnaise. You don't need a lot. Not even like a sandwich. You can use a pastry brush, or just smear it on with your fingers. Coat the chicken breasts with the seasoned flour. You can dip them in the flour, or you can sift or sprinkle the flour on. Meanwhile, heat the oil in a saute pan until hot. Fry the chicken on both sides until evenly brown and cooked through. Thanks to Raw Spice Bar for providing products for me to review; I wasn't required to write a recipe. This soup is sooo good. And so easy, particularly if you're starting from leftover, like when you buy that giant cauliflower from the farmer's market and you have a lot left. Of course, you can steam or roast the cauliflower just for this soup. But ... here's the other thing. You could make this with a different vegetable, or even a mix of vegetables, as long as you like them together. Which means this is great whenever you have leftovers. I'm all about finding good uses for leftovers. The rice mix I used here was actually a new mixed grains medly from Minute Rice - they sent me samples and I've been having some fun with it. It has several types of rice along with quinoa, and is meant to be cooked as a side dish, either on the stove or in the microwave, but I figured it would be fine in this soup. And it cooks fast, which means that this soup was ready to eat really quickly. Combine the cauliflower and chicken stick in a blender and puree until smooth, then transfer to a saucepan. You could also but both in a saucepan and use a stick blender to puree it. Heat on medium heat. Add the minute rice, stir to combine, and cook until the rice is cooked through. If you prefer a thicker soup, add the instant potatoes and cook for a few more minutes. Taste, and add salt and pepper to taste. I happen to like creamy soups with a generous amount of pepper. If you like, garnish with some chopped herbs, or a complimentary vegetable, shredded or diced. I happened to have some brussels sprouts, so I used that. I received samples of the Minute Rice Multi-Grain Medly at no cost to me. I wasn't required to use it in a recipe, but it worked really well here. And yes, I'd buy it again. It's handy to have on hand. And I'm kind of a fiend for rice. Thanksgiving Bread Pudding - now with cranberries! I love stuffing. I've even made bread that tastes like stuffing - which is pretty amazing for a turkey sandwich. But that's not the same as actual stuffing. I grew up eating stuffing that was cooked inside a turkey. Lately, though, I've been cutting the turkey up and cooking the pieces separately. A few times, I've smoked the breast while cooking the dark meat in the oven. But ... that meant I had to find a different way of cooking the stuffing. I tried a lot of variations of cooking stuffing in a casserole dish - which I guess means it's dressing - and they were all fine. But then I had the brilliant idea of making a stuffing flavored bread pudding. And it was amazing. This year, I decided I wanted an early Thanksgiving, so I bought and cooked a small turkey breast. I enjoyed my sandwiches, but then I started thinking about stuffing. Then, I went to an event sponsored by Sprouts Farmers Market and they tossed a can of cranberry sauce into the goodie bag. And I had a great idea. A stuffing bread pudding studded with chunks of turkey, with a layer of cranberry sauce on the bottom. It was like Thanksgiving in one bite. This would be a great lunch or brunch meal, or a perfect dinner item for folks who like the stuffing better than anything else. You could certainly use leftover cooked turkey for this. Or, if you're not the one who hosted the holiday and you have no turkey, you could cook a small turkey breast, or you could get some turkey deli meat. Just ask for the turkey to be cut into 1/2-inch slices so you can cut it into cubes. This would also be good with chicken instead of turkey. Preheat the oven to 350 degrees and have an 8- or 9-inch baking dish standing by. Heat the butter in a saute pan. Add the celery and onions and cook until it begins to soften. Add the poultry seasoning, sage, salt, and pepper. Continue cooking, stirring as needed, until the vegetables are cooked through. Taste for seasoning. This should be well seasoned, since it will be combined with a lot of bread and eggs. Put the bread in a large bowl. Add the cooked vegetables and turkey. Toss to combine. You don't want to mash or tear the bread any further - just mix it together. Spread the cranberry sauce evenly on the bottom of the baking dish. Add the bread cube mixture to the baking dish. Beat the milk and eggs until well combined. Pour this over the bread in the baking dish. The amount of liquid the bread will absorb depends on the bread, and how dry it is. You want to make sure all the bread is moist, and that there is liquid surrounding the bread. It's fine if there are bread cubes sticking up above the liquid a little but there should be visible liquid. Here it is, before it went into the oven. If the bread isn't thoroughly moist, and there's not enough liquid, beat some more eggs with milk and add it as needed. If you need just a small amount of liquid, you can just add extra milk. Bake at 350 degrees until a knife inserted in the center comes out clean. It's fine if it's wet, but it shouldn't be coated with egg. Serve hot or at room temperature. This is also good cold, if you happen to like cold stuffing. The Sprouts event was held at the National Cattleman’s Beef Association, and had absolutely nothing to do with turkey - we learned about cooking beef. But yeah, I used their cranberry sauce in this recipe and they provided a gift card to allow me to shop for anything I liked. Let's get this part over first. According to baking nerds on television, "sables" is not pronounced like the furry animals. It's pronounced something like "sah - blays" and probably with a slightly jaunty French accent. Which makes sense, since this recipe comes from the book French Desserts by Hillary Davis. This post is part of a group post organized by the newly revised Virtual Potluck and sponsored by Anolon, WÜSTHOF, Paula Deen, Microplane, Gibbs-Smith, and Nielsen-Massey, who provided products to the participating bloggers as well as items for our giveaway. Yes, I mentioned a giveaway. It's at the bottom of this post, and there's lots of awesome stuff you could win. If you aren't familiar with Hillary Davis, you can read about her book Cuisine Nicoise on my blot here where I made a recipe for broccoli, and her book Le French Oven where I made some yummy soup here. But let's talk about sables. If you haven't figured it out yet, they cookies. Yup, chocolate cookies. They're lovely and crisp and not too sweet, but then they're sprinkled with sparkly sugar on top, so if you want them sweeter, you can certainly add more sugar. I thought it was interesting that these were brushed with an eggwhite wash before sprinkling with sugar. I don't think I've ever done that with cookies. I've eggwashed bread, and it made it shiny, but it was a new idea for cookies. This recipe called for Hershey's Special Dark Cocoa, but I didn't happen to have that. I did have three other kinds of cocoa, though, so I used black cocoa. I'm sure these will work just fine with whatever you have. I mean, there's just no way these could be bad. The cookies were lovely with some eggnog for dessert. Microplane gave us each a cup grater and a spice grater to use in our recipes ... I used them to garnish my eggnog - a whisper of nutmeg and then a little bit of grated chocolate. Because, well ... why not? The cup grater is particularly interesting. You can set it right on a cup or mugif you want to, but it's really nice for holding it above the mug - which you'd need to if that mug was full. The funnel shape means you can do your grating and get the ingredients right into the mug instead of spilling onto the rim or onto the counter. ALSO, this would be really great for grating chocolate on top of cupcakes, right? That little spice grater is ideal for nutmeg. I just love it! Sift the flour and cocoa together in a mixing bowl, then add the salt and which together. Okay, in all honesty, I just piled the flour and cocoa into a bowl and whisked. I didn't sift at all. There were a few tiny lumps in my cocoa, but they broke up easily. If your cocoa is particularly lumpy, you might want to go ahead and sift. Oh, and I used one of my spiffy new Paula Deen mixing bowls. I love the stripes! Beat the butter, confectioner's sugar, and granulated sugar with a stand mixer fitted with the paddle attachment, scraping down the bowl several times. Pour in the flour mixture and mix just until well combined. Scoop the dough onto a large sheet of plastic wrap, form into a ball, and place another sheet of plastic wrap on top. Use the palms of your hands to flatten it, then use a rolling pin to flatten it to about 1/4 inch thick. Refrigerate for 30 minutes. Meanwhile, heat the oven to 350 degrees and line a baking sheet with parchment paper. Of course I used my new Anolon cookie sheet. It has a nice silicone grip so it's not as hot to hang onto, but of course I used a mitt when I took it out of the oven. Use a cookie cutter or a glass to cut out round cookies. Since the instructions didn't mention a size, I used a sort of small cutter, because I don't like giant cookies. That way, I can have just one cookie if I'm not too hungry, but two cookies isn't too much, either. Place the cookies on the baking sheet, brush with the eggwash, and sprinkle with the sugar. Just for the fun of it, I made one batch with the eggwash and one without. The ones with the eggwash were shiny and had sort of a crackled appearance, and the ones without had a more matte finish. They tasted the same, so the difference was mostly appearance. Bake for 13-15 minutes. The instructions say to bake until crisp, but the were soft while hot and got crisp after cooling a bit. Just make sure they're done. Let the cookies cool a few minutes on the baking sheet, then move them to a rack to cool completely. Needless to say, I used the rack that came in the Anolon set. I haven't used the cake pans yet or the loaf pan that came with the Anolon set yet, but I'm pretty excited about them. The surface is really slippy, so I shouldn't have any trouble with cakes sticking. I used the parchment paper on the baking sheet that this recipe called for, but I think the cookies would have been fine without them. Besides the fun products I used in making the cookies, I got a few items that didn't quite fit this recipe. The cake knife from WÜSTHOF looks like just the right thing to slice through cake, and the triangular shape will be perfect for lifting slices of cake for serving. And then I received both lemon and almond extract from Nielsen-Massey. I considered using the almond extract in the cookie recipe because almond goes well with chocolate, but then I decided to stick with the vanilla called for. I'm kind of a fiend for vanilla - I buy it in 32-ounce bottles . Yeah, I'm crazy. But that's how much I use. One giveaway winner will receive a copy of French Desserts by Hillary Davis, an Anolon Advanced Bronze 5-piece baking set, a Paula Deen 3-piece mixing bowl set, a WÜSTHOF GOURMET 6-inch Cake Knife, a Microplane Premium Classic Spice Grater and Spice Cup Grater, and Nielsen-Massey almond and lemon extracts. 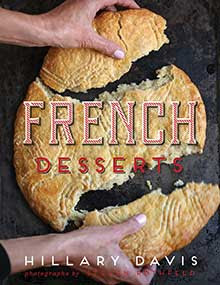 A second winner will receive a copy of French Desserts by Hillary Davis. The giveaway is open to residents of the US. Anolon and other Meyer products are sold through PotsandPans.com. Find them on Facebook and Twitter. Anolon is on Facebook, Twitter, and Instagram. Microplane is on Facebook and Twitter. WÜSTHOF is on Facebook, Twitter, and Instagram. Gibbs-Smith is the publisher of the cookbook. They are on Facebook and Twitter. Hillary Davis is on Facebook and Twitter. Nielsen-Massey is on Facebook and Twitter. 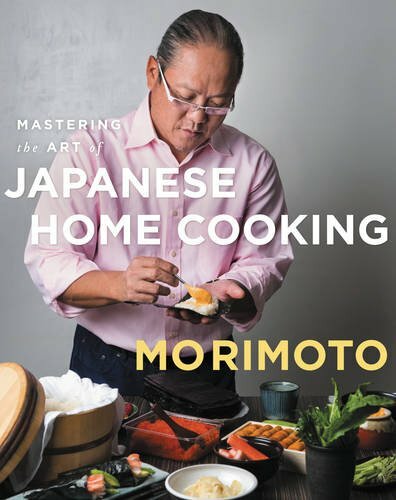 When I got a copy of Masuharu Morimoto's new cookbook, Mastering the Art of Japanese Home Cooking, I wondered what I had gotten myself into. Japanese ingredients aren't exactly common around here. So I wondered if I'd be able to make a lot of recipes from the book without substituting the heck out of them. I have to say that I was pretty pleased that the majority of the recipes were doable with things I could find at my local grocer. And for the most part, the unusual items were of the dried, seaweedy variety that I could order from Amazon, if need be. There were a few that I probably won't be able to find easily, like vacuum-packed pre-cooked lotus root or some specific types of vegetables. But that's okay. It's unlikely that I'd ever cook every recipe from any cookbook. And I'm pretty good at substituting, if need be. I had a couple recipes bookmarked. One was a chicken meatball recipe with teriyaki. Another was a Japanese-style hamburger. But then I decided to make a side dish instead, and settled on a green bean recipe. I had absolutely everything I needed, so that was a plus. Well, I have to be honest. I used frozen green beans. But I had everything else I needed. This is intended as a cold salad, so it's a great prepare-ahead dish. The instructions say that it's good for up to a day, but I have no problem letting dressed vegetables sit in the fridge for longer. And while this is supposed to be a Japanese dish, it would work perfectly well as a side for fried chicken, meatloaf, or any typical American meal. It's also nice added to a green salad. Put the sesame seeds in a small skillet over medium heat and toast, stirring or tossing often, until they're a few shades darker. Transfer to a bowl so they stop cooking, then pound them in a mortar or blitz in a spice grinder until you have a slightly coarse powder. Note: I liked the look of the photo that had some whole seeds, so I used the mortar and pestle so I would have some small bits and some whole seeds. Have a bowl of ice water or super-cold water standing by. When the beans are done cooking add them to the bowl of cold water. When the beans are cool, remove them from the water and pat dry. Note: if you need to, drain the water and add more cold water to get the beans chilled. Combine the soy sauce, mirin, sugar, and sesame seeds in a medium mixing bowl. Add the beans and stir to combine. Mound the beans on a plate and serve. One of my new favorite cookbooks is The Great Big Pressure Cooker Book by Bruce Weinstein and Mark Scarbrough. I've written about it a number of times, and every time someone asks me for a good cookbook to go along with their Instant Pot, I recommend it. Yeah, I really like that book. A lot. Hint: Make the cheesecake! 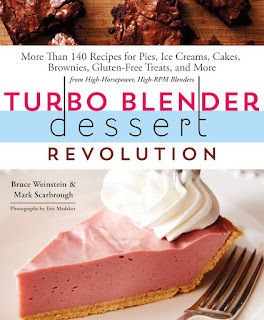 So when I heard that those same authors had written a cookbook called Turbo Blender Dessert Revolution specifically for high-powered blenders (like the Vitamix or Blendtec ) I knew I had to have it. I was so excited, I pre-ordered it. I seldom do that. As I browsed through the book, there were a ton of recipes I wanted to make. I had all the ingredients for the very first recipe in the book - vanilla pudding - so I was in the kitchen immediately, blending and "cooking" pudding in my blender. Well, shoot, if a book author tells you that you have to make a recipe, there's probably some kind of law that says you have to, right? Or maybe just a Facebook obligation. I had used up all the eggs on the pudding, so I had to wait until I bought more, but it wasn't long before I was in the kitchen, blending the batter for the brownies. There is no flour in this recipe, and no leavening. And no, it's not cooked in the blender. You do the mixing, then you put it in a pan and bake it. While there are some recipes that are 100 percent prepared in the blender, there are a lot of them where you also use another appliance, like an ice cream maker or an oven. But the blender isn't just taking the place of a hand mixer. It is used for purposes besides simple mixing. For example, there are recipes where you grind flour and then mix ingredients for something you're going to bake. 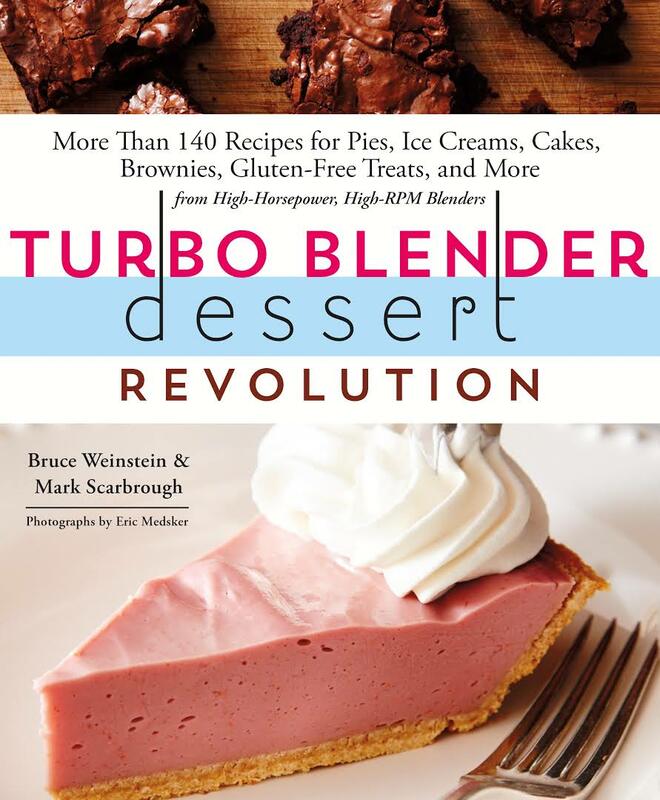 If you have one of those high-powered blenders, this book will for sure get you using it for more than smoothies and blended cocktails. Make the brownies. Trust me. The book notes that they almost didn't want to label these as gluten-free, since they wanted "everyone to make them." Well, okay, they got me to make them. And I see what they mean. They're gluten free, but you'd never know it. They're just yum. Heat the oven to 350 degrees with a rack in the center. Butter a nonstick 8-inch square baking pan (I used baking spray), then line the bottom of the pan with parchment paper (I made a sling rather than just covering the bottom) and then butter the parchment (again, I used spray). Put the butter and chocolate into a microwave-safe bowl and microwave on high in 10-second bursts, stirring each time, until about 3/4 of the chocolate is melted. Then remove the bowl from the microwave and stir until smooth. Set aside at room temperature for 15 minutes. This is a good time to do all the measuring of the rest of the ingredients. Blend at the highest speed until the mixture is smooth and airy, about one minute. Add the chocolate mixture, cover, and blend at high speed for 20 seconds, until smooth. Add the cornstarch, cocoa powder, cinnamon (I didn't use it) and salt. Scrape down the inside of the container. Cover and blend at low speed, stopping the machine often to scrape down the container to make sure it's all mixing evenly. This should take about 30 seconds of blending for it to be evenly blended and smooth. Remove the blender container from the machine and add the nuts. Stir to combine. Scrape the mixture into the prepared baking pan. Bake until set and a toothpick inserted in the center comes out with just a few moist crumbs, about 35 minutes. Cool the pan on a wire rack for about 10 minutes, then turn out the brownies, remove the parchment paper from the bottom, and flip it right-side-up again on the rack or a cutting board. Let it cool completely before cutting. Oh, and just for the heck of it, here's some pudding for you. Sorry for the not-great photo. I hadn't planned on using it once I made the brownies, and this disappeared too fast for me to grab another photo. Oopsie! The pudding had an interesting texture. A little airy from the bubbles added from the blending. Really good! We're all going to need a drink on election day, right? Well, I've got two of them right here. I'm not getting political, just having fun with some names that seemed perfect for cocktails, Bad Hombre and Nasty Woman. They sound like drinks you'd find on a trendy bar menu, right? Heck, I'd be surprised if someone isn't already using them. But these are my versions. Either of these could be served as mocktails, of course, which is wise to do before you've voted. After voting, however, a cocktail might be appropriate as you watch the votes roll in. And there's a third drink I've included as a bonus. Possibly for the day after the election. For celebration, to drown your sorrows, or, really, it's just for the fun of it. And, since it's a party ... and maybe because you didn't cook anything because you were busy voting, I think some snacks make perfect sense. So I've got that, too. Because I'm a food blogger, I get samples of a lot of stuff to review over on my review blog, but this time I decided to use some of those products to create cocktails and for the election day party. I mean, they're here. Might as well use 'em, right? If you're interested in the products, there's more information about them at the end of the post. Meanwhile, let's mix up some tasty drinkies, shall we? Bad Hombre evokes something a little sinister, spicy, and south-of-the-border, so I decided that peppers and chocolate had to be involved. A boozy, spicy hot chocolate seemed perfect, but what about the liquor? I considered tequila, but opted for rum, instead. Rather than adding the heat to the drink itself, I rimmed the glass with a chili-chocolate sugar. Wet the rim of the glass with a little bit of water. Dip it in the chili chocolate sugar. Add the rum to the heatproof glass. Add hot chocolate to fill. I decided that this drink should be just a little sweet, but also tart. A little spicy. And not shy about the choice of alcohol. Whisky. For a garnish, I chose lemons sprinkled with a bit of flaky salt. Because a nasty woman would be a bit of a salty tart. Or a lot. I mean, what the heck. Use half of a lemon as a garnish. Because, why not? The base of the drink is a spiced cranberry and citrus juice. Cut a slice in that lemon so you can affix it to the side of the glass in a perky but slightly menacing manner. Sprinkle a little salt on the cut side. Okay, if you want, you can add ice to the glass. Wimp. Drink, refill, repeat, as necessary. If you ask me, one of the best things that has come out of the debates is the word "bigly." Okay, I know it's not a word. Yet. But it will be a word. Or it should be a word. I'm an admitted word nerd, and I want to use that word as a reply to questions like, "Did that brownie recipe work out for you?" And then I reply with just one word. "Bigly." It's like Big-Time and Happily rolled into one. The brownies were awesome, it says. "How did you do on the job interview?" "Did you like your birthday present?" I mean, seriously, I'm a little in love with it. Get a BIG glass. Okay, let's be honest. I made this just because I wanted to use the giant glass. Fill it with whatever you want to fill it with. Tears of joy or angst. Champagne or moonshine. Chili-Chocolate Sugar from Spiced Up. They also sent a cute little metal stirrer. It's adorable! These aren't the same as lemons I've bought at the store. More lemon, less bitter. I used the regular salt, but the chipotle or mesquite would have been interesting, too. This is different. It's like a mulled wine, but non-alcoholic, with cranberry and citrus. It can be served warm or chilled. I've been drinking it plain, but it was awesome in a cocktail. They sent syrups, switchel, and a ready-to-drink haymaker's punch. I'm sure you'll see more cocktails using these in the future. This had some fun stuff in it that would be perfect to dive into and snack on along with the cocktails. This basket had pate, sausage, peppers, little toasts, sweet little peppers ... and it all came in a cute basket. They've got other baskets to choose from, but I loved this. The sausage is already gone. The same folks who sent me the New Zealand salts also sent me some awesome chips and some sweets using manuka honey as well. If you can find those chips anywhere, I recommend them. The candies are really nice, too. I like having one or two after dinner. Just YUM. Thanks to all the companies who sent me goodies to sample! This was way more fun than it should have been.